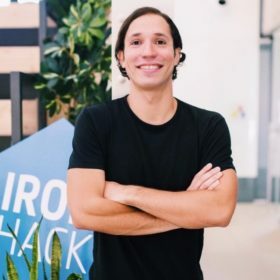 Ariel Quiñones is the co-founder and co-CEO of Ironhack. Ariel was born and raised in Puerto Rico. Ariel studied Government and Economics as an undergraduate at Harvard, before working at Merrill Lynch and Credit Suisse in New York. He then served as CFO of Oppa – a São Paolo startup that offers Brazilians affordable and high-quality design furniture online. Ariel met Gonzalo, Ironhack’s co-founder and co-CEO, during their MBA years at Wharton. Upon meeting they discovered a shared desire to stray from the corporate world and create an impact on the world’s failing education system. After graduation, Ariel and Gonzalo began with market research. They spoke to Europe-based employers, recent graduates, and tech thought leaders to better understand the mismatch between job market requirements and existing educational curriculums. They found 700K job vacancies in Europe’s IT field, yet an unparalleled youth unemployment rate. The tech sector was struggling to fill openings, while recent graduates were struggling to find jobs. Determined to fill this gap, they hired an expert software engineer to help develop a blueprint web development curriculum. In 2013 they launched their first official Ironhack course (9-weeks) with a class of 12 students, and the inaugural program’s success gave way to rapid expansion. Just 18 months later, the company had launched additional campuses in Barcelona and Miami, and achieved a 90% job placement rate. Ironhack is an educational community offering part-time and full-time technical courses across three disciplines – Web Development, UX/UI and Data Analytics – to fill the increasing education gap and prepare the next generation of tech employees. Today’s educational institutions fail to prepare students for tomorrow’s workforce. The advent of the digital age has left traditional universities stuck in antiquated curriculum that no longer equips students for the rapidly growing tech job market. Ironhack offers full-time (9 weeks) and part-time (24 weeks) technical courses, commonly known as “bootcamps”, in Web Development, UX/UI, and Data Analytics, across 9 campuses worldwide (Madrid, Barcelona, Miami, Berlin, Amsterdam, São Paolo, Mexico City, Paris, and Lisbon). Ironhack offers courses in English, Spanish, and Portuguese, depending on the campus. Aiming to provide a high ROI for every student, Ironhack’s programs are taught by instructors with experience at leading tech companies such as Visa, Cabify, and Google. In addition to being the first local mover in many of its markets, Ironhack also differentiates itself by toting a more rigorous application process to keep the bar high on student quality, performance, and success. This holistic approach prioritizes student outcomes and enables Ironhack to deliver a superior consumer experience. Ironhack also offers a suite of lifetime career services, backed by an extensive network of 600+ partner employer companies, and 2,500 graduates from 70 nationalities. In 2018, Ironhack was recognized as the 2nd best Coding Bootcamp in the world by SwitchUp, second only to Le Wagon, a school that focuses exclusively on full-stack development.